We are one of the leading manufacturers and suppliers of the wide assortment of Health Mix Roasters. Made by following all international specifications, these health mix roasters are highly acknowledged for their attributes such as durability, performance and reliability. Supervised at every stage of production, by our highly dedicated team of professionals with the help of sophisticated technology, these roasters are of world standard. Safe packaging and competitive price makes these roasters very sought after in the market. Our organization is involved in manufacturing of superior qualityHealth Mix Roaster. 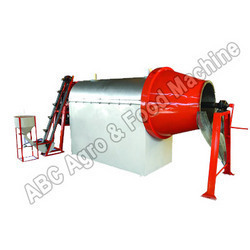 Health Mix Roaster are fabricated using very high grade raw materials. High in demand, for use in all kinds of food processing units, these are time and again tested by our quality professionals. Like all our products, these Health Mix Roaster also retain all their attributes like durability, reliability and supreme performance under extreme conditions. Available in Sandless and Sand roasting model, these machines can be operated with different kinds of fuels.